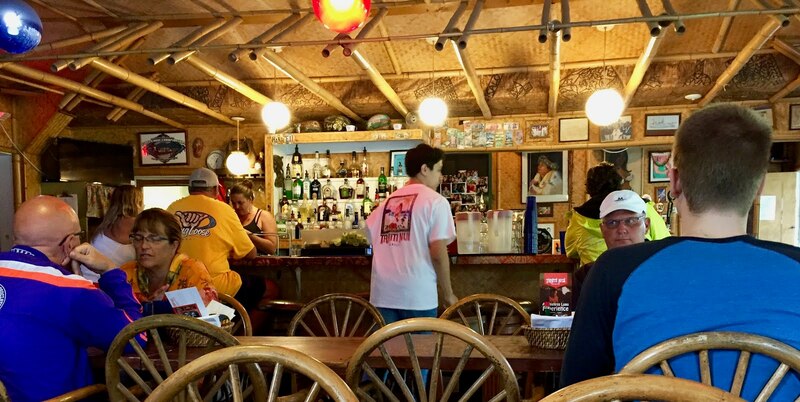 I found myself, awhile back, in Hanalei, Hawaii, at the Tahiti Nui Bar and Restaurant (pictured below). The Tahiti Nui got pretty good reviews on Trip Advisor, as I recall, and I showed up on a rainy day, looking for lunch. It was definitely a "locals" hangout, particularly the Bar. The young server (who is pictured in the middle, above) let me know that the Mai Tai cocktails served from the Bar were the speciality of the house. Since I don't drink, I stuck with water. I am able to attest that the burger I ordered was very good. The pizza seemed great, too, based on what I could see from guests at an adjacent table. Those drinking the Mai Tais (and almost everybody was) also appeared to be more than happy! Why, though, was I in Hanalei, Hawaii in the first place? Good question! "Puff The Magic Dragon" is generally thought to have been composed as a musical celebration of the joys of marijuana use. 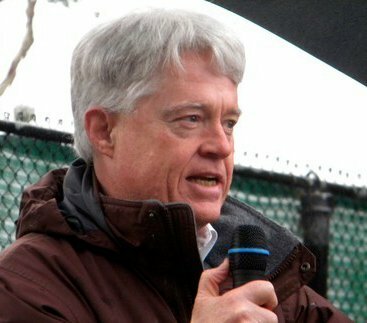 Since I went beyond former President Bill Clinton, and not only didn't "inhale," but never even came close to a position in which that could be a question, I always had more of a geographic idea about the song, as opposed to an understanding based on a possibly mystic derangement of my ordinary perceptions, just by taking a few little "puffs." In other words, I always understood the song to refer to Hanalei, Hawaii. So, visiting Hanalei, this reportedly magical and mystical place (though without the benefit of marijuana), was prompted, at least in some part, by my recollection of that "Puff The Magic Dragon" song. Imagine my surprise, when I looked it up later, to find that the online lyrics never actually used a spelling that tracked the name of the town. One version had it Honahlee. One had it Honnah Lee, and another had it Honali. Good to know, I guess. I liked Hanalei (the town), anyway. 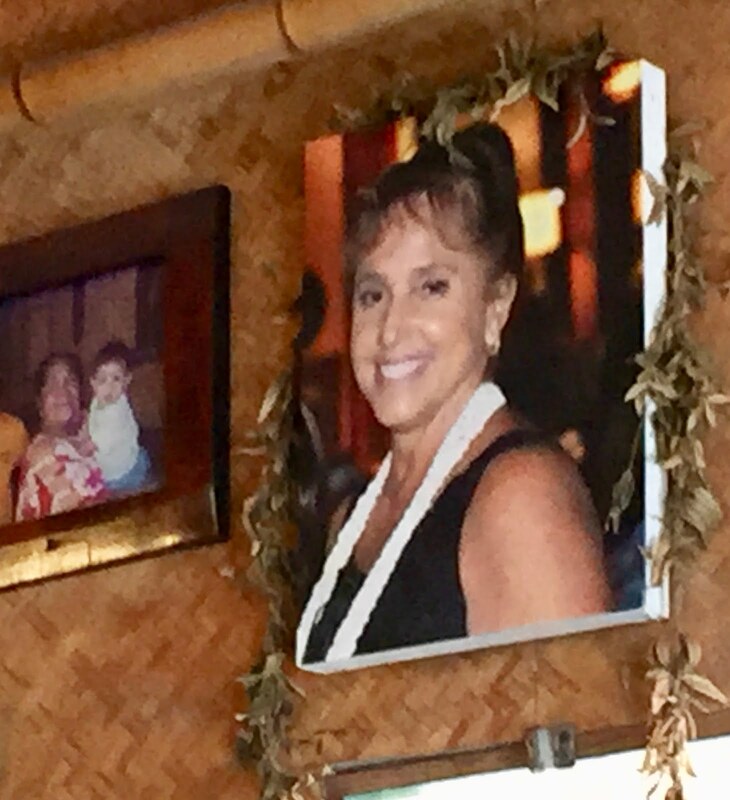 The picture at the top of this blog posting hangs in the Tahiti Nui Restaurant and Bar, located in Hanalei, Hawaii. When I was almost done with lunch, asking for the check, I inquired of the young server who the woman was. I had decided that she must be dead, and it grieved me to think so, so full of life she appeared in the wonderful photo on the wall. "She was a real cool lady who worked here," I was told. "She's passed. I didn't know her, and I don't even know her name, but she was really cool. Everyone loved her." It has been more than fifty years since I first heard Peter, Paul and Mary sing their cheery song. Now I have been to Hanalei. Now I have seen that picture, too. Now I am thinking of the wonderful, magical, mystical, ephemeral life that we each are given, in whatever measure, great or small. Tears among the raindrops, in a land called Hanalei. I came across your blog while researching Hanalei and the "Puff" song. Yesterday, a friend asked, "If you had only two weeks to live, where on earth would you like to be? My immediate response was, "A house on the beach at Hanalei." She about fell over, as it is also her most favorite place in the world. I have been there three times now and hope I can go again. I, too, am of an age that accepted the lyrics at face value as being a fantastical tale about a boy and a dragon and it is one of the first songs I learned to play on guitar. I enjoyed reading your blog and am delighted that you had an enjoyable visit in this enchanted locale. I, too, thought the "land of Honalee" referenced the island town, but the lyricist's blog response is that he wrote the poem before having ever heard of Hanalei, HI. What a nice note! Thank you very much! I am going to pass on your research to readers on my Facebook page, which is where most people probably see my blog postings, since my blog republishes there automatically. Naturally, since I did associate the song with Hanalei, Hawaii, I appreciate learning the truth. And since it's true that I have never even tried marijuana once, I like knowing that the song is supposed to be about childhood innocence, not the drug. Innocence lost was really the theme of my encounter with Hanalei and the Tahiti Nui Bar. I was moved by that picture, as I reported, and I was moved by the last line of Lenny Lipton's explanation, too, in a similar way: "And thank you, Honalee. I’m heading your way." I am heading that way, too, and depending, of course, on how that goes, I'd be happy to connect up with Puff, and the "cool lady" whose picture I saw in my visit to Hanalei!